Whenever anything gets popular, there will no doubt be people who don’t like it and become rather vocal about their opposition. Sometimes they will voice legitimate concerns, but other times they will have objections that are not grounded in reality. Such is the case with backyard hens. I was sadly shocked to see that NBC fell prey to some misinformed animal activists last month. I wish animal activists realized they are hurting chickens far more than they are helping them when they try to talk people out of having backyard hens. The vast majority of Americans are not going to become vegans, so if they don’t have backyard hens, they will be buying eggs from the supermarket — eggs that probably (95% likely) came from a factory farm where the chickens have their beaks cut off and are kept in small cramped cages and never see the sun or chase a bug across the grass. I’ve listed a few quotes from the article that present some of the worst misinformation, followed by my response with the correct information. Hens actually lay eggs for many years, at least two-thirds of their natural life, just like other creatures. If their reproductive life represented only 20% of their lifespan as this quote implies, that would mean they have the shortest reproductive life of any animal on this planet. These people have simply assumed that because factory farms kill hens after two years, that they no longer lay. Wrong! Hens are simply not profitable enough for factory farms after their second year, but they are still laying. We don’t butcher our hens until they are three years old. Initially we kept some hens until they were five years old, and even at that age, they were still laying an egg every week. 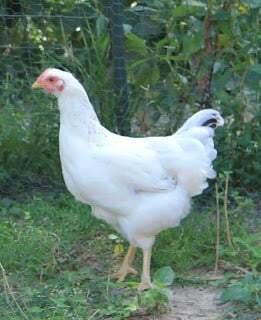 However, an egg a week compared to four to six eggs a week is a rather expensive egg, which is why we now turn our hens into stew meat at about age three. I have a friend who is a vegetarian and has a flock of 9-year-old hens that still lay! Factory farms are noisy, filthy, and the parts that have not been automated are labor-intensive. Backyard chickens are less noisy than a dog. I generally tell people that taking care of a small flock of hens is about the same amount of work as a cat. Chickens are actually less messy than many cats. Ever had a cat that would scratch its litter so vigorously that it would get tossed out of the litterbox? They are also less expensive than a dog or cat — and they give you eggs in return! This quote came from a shelter director and is just plain sad because a lot of people could be fed by 225 chickens. And if someone is not willing to eat a rooster or a backyard hen that is past its laying prime, but they are willing to buy chicken at the store, they are just plain hypocritical. People need to realize that those chicken nuggets came from a real, live animal that died. And almost all chickens that are sold in the supermarket were raised in factory farms and fed drugs in their daily diet to keep them alive because of the filthy conditions in which they are being raised. In 11 years, we have never had a chicken that needed drugs. Unfortunately, modern humans are so far away from our food roots that I have heard too many people say that old hens are not good to eat. Argh!!! Even Julia Child said that old hens provided the best broth. Slow cooking an old hen with plenty of water, over a low heat, for a few hours makes a delicious, tender meat that can be used in soups, casseroles, and salads. The scenario in those two paragraphs describes what happens in factory farms. Hens in factory farms have half a square foot per bird, and they get zero veterinary care. All factory farms “use enhanced feed, light, or other tools to prompt hens to lay constantly.” If factory farms didn’t do that, the egg section of the grocery store would be stocked quite sparsely from November to February as hens naturally quit laying in the months with less sunlight. 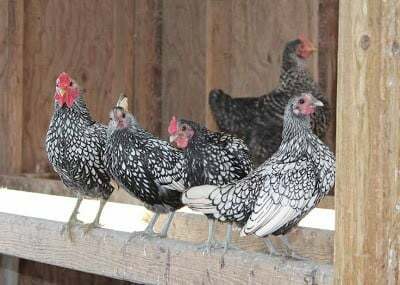 Although some backyard chicken keepers do light their coops to encourage hens to lay through the winter, many don’t. Rather than buying breeds that have been specifically bred to be good egg layers, most backyard chicken keepers have heritage breeds, many of which are on the verge of extinction and will only be here for future generations if backyard chicken keepers become stewards committed to keeping those breeds alive. Those breeds lay a good amount of eggs — four to six a week — but that’s not profitable enough for factory farms. In eleven years we have never had a chicken have a problem with egg binding, the oviduct problem to which the animal activist refers, which is sadly common with the enhanced breeds developed for factory farms. I don’t know anyone who has bought chickens because of “misplaced rural nostalgia.” Most people who want backyard chickens want them because they abhor the conditions in factory farms, so they are certainly not going to mimic those conditions. Yes, every now and then you might hear about someone keeping a couple of chickens in their basement, but you also hear about someone keeping 20+ cats in filthy conditions, and no one paints all cat owners as irresponsible and inhumane. Recently someone on a chicken forum asked if they could keep chickens in their basement, and community members responded negatively, some with simple facts and others with more emotional responses. The reason that we have people giving away hens that are not laying much any longer is because of ignorance. We need to educate people about their food choices — including animal rights activists who think that chickens only lay eggs for two years! Unfortunately few people in our society have the “common sense” that our ancestors possessed about food. Most modern Americans think everything comes from the grocery store and don’t see a difference between a box of dehydrated mashed potatoes and a piece of chicken. A dinosaur-shaped chicken nugget doesn’t look anything more like a chicken than a pile of dehydrated potato flakes looks like a potato. But the plight of the potato and the chicken are very different because chickens are sentient beings. If you don’t do your homework before deciding to plant a garden, and your garden fills with weeds and produces very little to eat, you are the only one who will lose. But if you get chickens without knowing what you are getting into, that creates an entirely different situation. Just as you should do your homework before bringing home a dog or cat, you should do your homework before bringing home chickens. If the people in that article really cared about chickens, they would work on educating people, not simply condemning every chicken keeper as a mini-factory farmer. I am probably preaching to the choir here, but if you know anyone who is thinking about getting chickens, you might want to share this post with them. In this post, I talk about the things you need to consider and the decisions you need to make before starting a backyard flock. Well said. This was a very informative rebuttal to the NBC story. It's really unfortunate that people can label uninvestigated reporting as news. Thanks for clearing up the misinformation! Deborah, you are one cool chicky. You tell 'em! When people come over to my suburban yard and see my girls, I do let them know that it isn't that easy. You do have to let them in and out of the cage every single day (or find a reliable hensitter in a town where the ordinance hasn't been changed yet). Predators are everywhere these days, and we've been pretty lucky for a couple of years now. BUT, we have lots of trees, grasses and shrubs for them to free range from morning until night. They are happy hens. In one year, with three hens, we received 65 dozen free range, organic eggs. We are down to two hens now, and the count goes down as they get older, but they are part of the family. Totally entertaining and endearing. Well said. Any thinking person would do their research instead of lambasting an entire group of people for their "unethical" practices. We have ducks (Muscovy). The most common response I get is why? I tell people because they're quieter than chickens!Most of the time you can't even tell that they are there. Poultry and egg layers that have free range to live their lives as nature intended, eating bugs, grass, etc, are more fortunate that the poor birds who live their lives in a box, with parts of their body cut off, and being pumped full of growth hormones and antibiotics. When you know where your meat comes from, you are also less likely to eat so much of it! Great post. Thanks for trying to counter some of that ridiculous article!